Muscle-invasive bladder cancer is a complex and lethal disease that requires dedicated and often multidisciplinary management. It is imperative that clinicians are well-informed of the most recent practice guidelines in the care of muscle-invasive bladder cancer to ensure optimum delivery of care. Consensus guidelines are useful as they serve as a summary of the best available evidence that allows the clinician to more easily put evidence into practice. Consensus guidelines for muscle-invasive bladder cancer have been generated by authorities in the field and published by the National Comprehensive Cancer Network (NCCN), International Consultation of Urologic Disease (ICUD), and European Association of Urology (EAU). 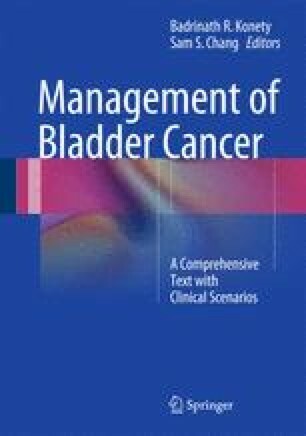 In this chapter, we have reviewed and compared the clinical practice guidelines for the management of muscle-invasive bladder cancer of the NCCN, ICUD, and EAU.